Waaaaah- that's me crying that my baby is already 11 months old! Time sure does fly when you're having fun- WOW! Bella is so busy and in to so many new things. Here's an update on our sweet girl. *There are affiliate links in this post. 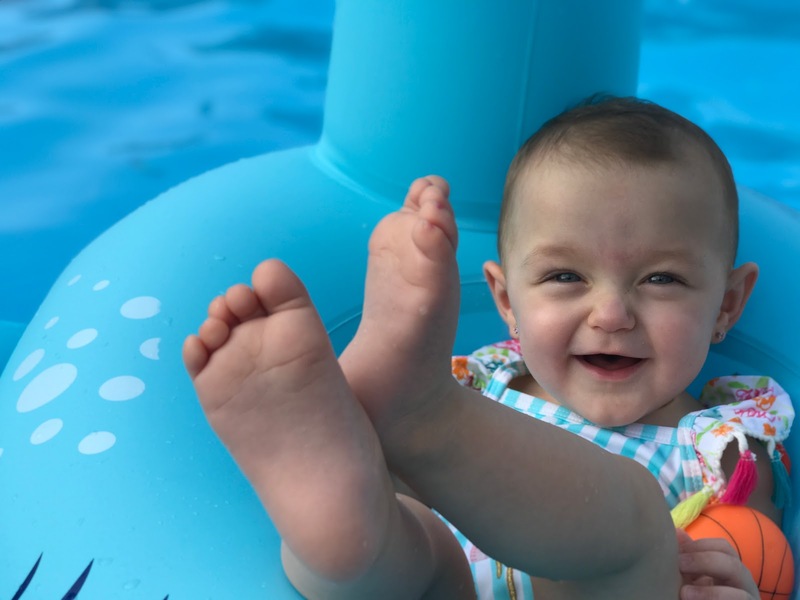 Loves: Playing, crawling and standing allll over the place, finding cords, tumbling and rolling around like she does gymnastics, and seeing other kids. BC also loves babbling- sometimes she get's SO in to her stories she laughs and smacks her hand down and throws her head back :) She's been saying mama and da-da and has added blah blah blah and yea yea yea....ha-ha, it's so fun listening to her! Not a fan of: Getting dressed, and the vacuum. LOL Chuck pulled it out and turned it on the other night and she lost her mind. It was almost time for bed, so I thought maybe she was just being fussy. Then, last weekend I got it out to clean an area rug and she was about 5 feet away and started shaking and bawling so hard. I realized that every other time we had done it, she was either napping or asleep for the night...guess she's not a fan- HA! Sleeping: Ehh, is there an 10-11 month sleep regression?! When I checked Google, it basically suggested that there could be one any month...no help. Bella still sleeps through the night (THANK Heavens!) but she is going to bed later than she was and sometimes it is a workout to get her there. She has A LOT of energy and I think she just wants to be up and busy. So, we've tried a few things and what seems to work best is letting her play quietly in her room before bed and chill out in her pajamas and hope to wear out some of that last energy before bedtime. She's taking good, long naps twice a day usually and always wakes up so cute in her crib. Feeding: We tried A LOT of new things this month, so fun! Bella's tried rice (wasn't a fun- not sure if it was the texture or what. She tried some new purees, Gerber biscuits and a lot of solids. She still has her favorites and we are still working on the sippy cup. I went back to the smallest Advent one with two handles so she can get the hang of it. We got some Honest juice and watered it down for her to try, and it's going okay. Stats: Bella Charles is weighing in at 20 lbs. 6 oz. !!! We are so proud of her growth. We didn't get a chance to see how long/tall she is- hopefully we can before her one year-since her checkup is a few weeks after her birthday. She's getting a little belly and it's the cutest thing ever. I'm obsessed! Favorite Moments and Things I Don't Want To Forget From Month 11: We went to the beach one night to watch the sunset and Bella was so cute dipping her toes in the lake. I've been putting her in 2 piece pajama sets and it's the cutest thing ever to me- I love them. Bella is SO busy- she loves playing with toys and other kids and seeing her friends at the sitter. When we visit my grandparents they get the biggest kick out of how happy Bella is and it warms my heart. The one day she found their stack of the weeks' newspapers and decided that's what she wanted to play with- she was laughing so hard throwing the paper around and it made my grandparents crack up. 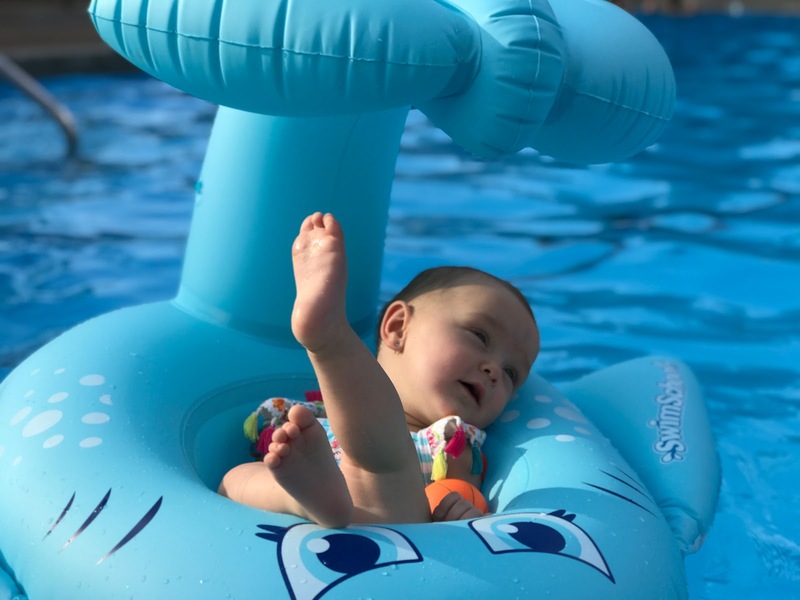 We enjoyed a few more pool days after work and it was a nice way to get some of her energy out- she loved chilling in her float. We went to the horse races and Bella liked seeing all the sights around her- she's a people watcher like me. We had one year photos last week and OMG- so much fun and they turned out so great. Bella woke up with a cough and stuffy nose- but you would never know it looking at the pictures. I can't wait to share more. Products We Are Loving: Parenting is weird and Facebook listens to what you're saying. This oogiebear cleaner popped up on my ad's one night so I checked it out. I read a ton of reviews and went ahead and got it- used with the Nose Frida, it gets the job done. Zoom Zoom Baby- these lift the flap books are so fun and make reading even more enjoyable for Bella. She shrieks and giggles when she finds something and loves being able to do something on the pages. I can't believe the next time I share an update, our Bella boo will be ONE YEAR OLD! 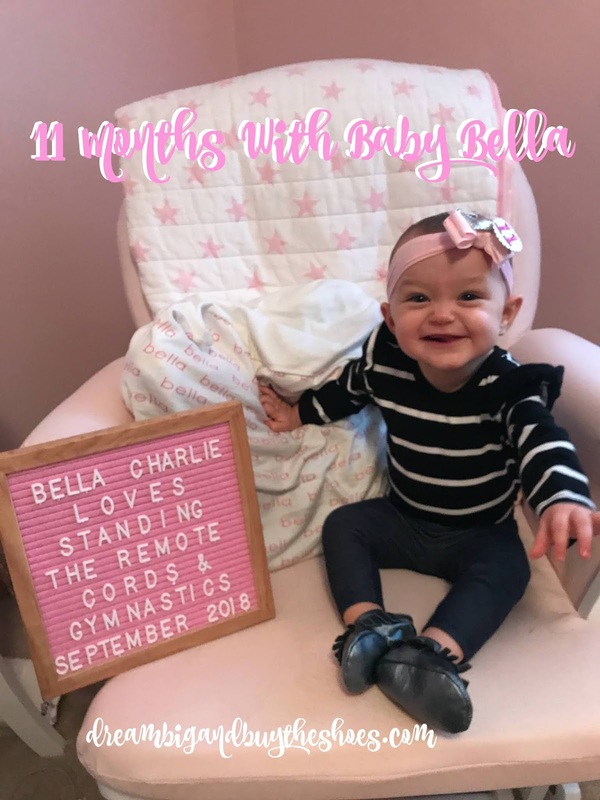 Wow- I have lots of fun pictures to share from a behind the scenes of our one year session and party planning gone wild...so expect lots more Bella pictures the next few months. Have a great weekend friends, HAPPY FALL!